Sometimes, putting together a sandwich is all the energy I can muster after work. At least it is still sort of cooking, right? If I am going to settle for a sandwich for dinner it is going to have to be a bit more than just slapping a few slices of wafer thing meat between bread. Despite my lactose intolerance, I often end up with some sort of grilled cheese on my plate. This grilled cheese recipe is one I put together for a cooking event I participated in years back. A list of ingredients was provided and the participants had to think of a way to put them together in a recipe. At that time, I was in a Foreman Grill stage and saw everything as a hot sandwich potential. As a result, the ingredients screamed ‘grilled cheese’ to me. Since it was for a recipe site, I broke the ingredients down to exact amounts but don’t be silly and think you need to follow them as more than just guidelines. Saute shallots, mushrooms and bacon in the olive oil until the bacon is cooked through but not crispy and the shallots are softened. Put the shredded cheese in a small bowl and sprinkle with cayenne pepper. Toss until all of the cheese is coated by the cayenne pepper. Put half of the cheese mixture on one of the slices of bread. 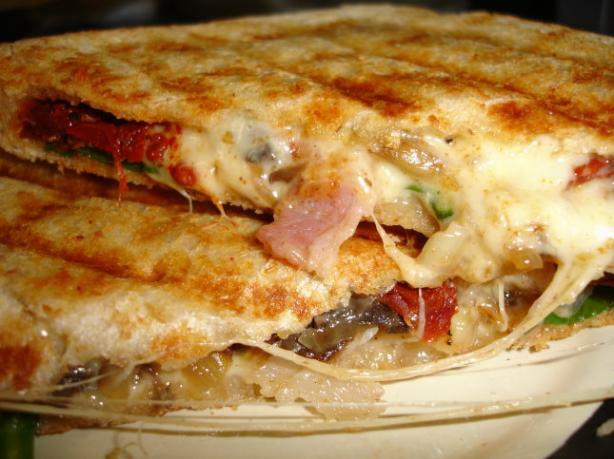 Top cheese with the shallot, mushroom and bacon mixture and spread out so that it fully covers the bread and cheese. Arrange the tomatoes on the bread so that they form two parallel lines down the middle of the bread. Put one spinach leaf on each corner. Put the second half of the cheese mixture on top of the spinach and top with the second slice of bread. Spray each side of the sandwich with butter flavored cooking spray and put onto a hot Foreman type grill and cook until the cheese is melted and the outside is golden (about 5 minutes) OR fry in a buttered pan as you would a traditional grill cheese sandwich. This entry was posted in Home Cooking and tagged cheese, Sandwich. Bookmark the permalink.